How do you select select multiple email messages in Gmail? Ideally, majority of users will click checkbox next to each email message for selection. This is very time consuming routine involving lot of clicking. You can easily select multiple emails quickly using Shift key and perform required tasks further. 1. Once you login into Gmail account, you should see default inbox view with listing of email messages. Click to select (tick) first message is the series of message listing (that you want to be part of selection). 2. Now press & hold the Shift key and then click last message in series. All messages between first and last will be selected automatically. You may omit specific message(s) in series by deselecting message(s). Once multiple messages are selected, you can perform further actions like marking email unread / read, deleting emails, adding labels, archiving and so on. 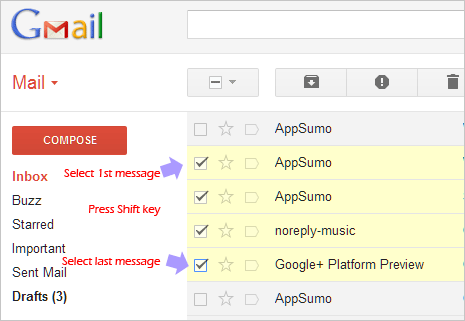 This method allows quicker selection of multiple messages between selected series of email messages in your Gmail inbox. 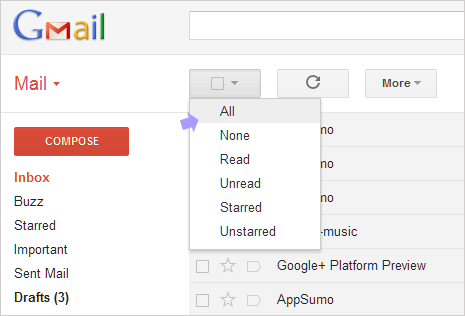 Selecting all messages – By default Gmail has option to select all messages displayed on single page of inbox window. Just click on down arrow button at top left part and then click on ‘All’ option. This will select all messages and you can use ‘none’ option to deselect email messages in Gmail.